Rob. Half Bob, Half Ron. This was the first color computer graphic I ever made, in 1986 at RISD. 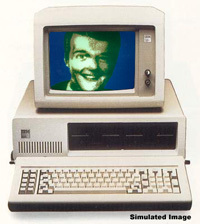 IBM PC/XT, 8 bit color, and output to 4″ x 5″ film with a Solitaire film recorder.